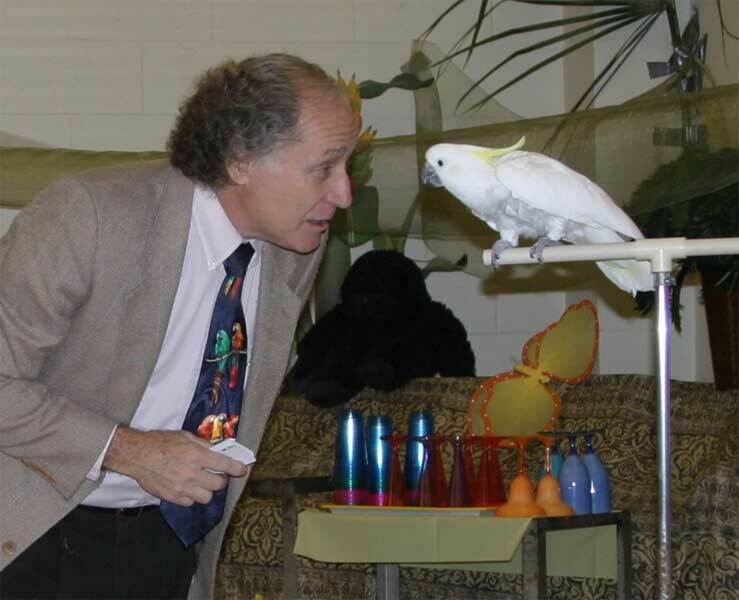 assisting Terry at a magic show. 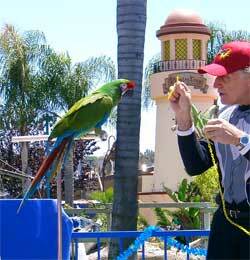 “CLYDE the MAGIC MACAW” accompanies Terry to all his magic shows for children. 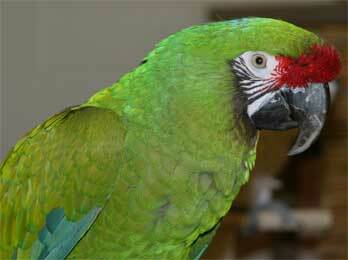 Clyde is a Military Macaw, one of the larger species of parrots. Military Macaws are native to Mexico, but Clyde was born in Ramona, California in 1990 and was handfed as a baby by the Runyons. As you’ll see in his magic shows, Clyde is a little mischievous but it’s all in good fun. When the magic show is over you’d better be careful walking past him with a plate of pizza or birthday cake – he may just steal it from you! perform his Mind-Reading Card Trick. “LOUIE, the MIND-READING COCKATOO” loves to show off! Performing his “Mind-Reading Card Trick” in Terry’s Stand-up Magic Show for adult audiences is one way that he can get the attention that he craves. Louie is a Sulfur-crested Cockatoo and is at least 35-40 years old, about middle age for a cockatoo that can live past 75! Sadly, he had at least three other owners before the Runyons found him in 1985. 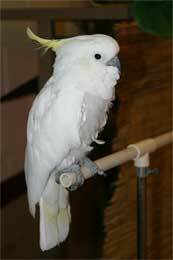 Because of the instability in his former life, Louie developed the habit of plucking his feathers – not unusual for a high-strung parrot like a cockatoo. But performing is in Louie’s blood, and hearing the laughter and applause when he magically reads a volunteer’s mind makes his day! As you can see, WINCHESTER is a "magic" bunny! His “job” is to appear at the finale of Mr. Runyon’s magic show for kids. 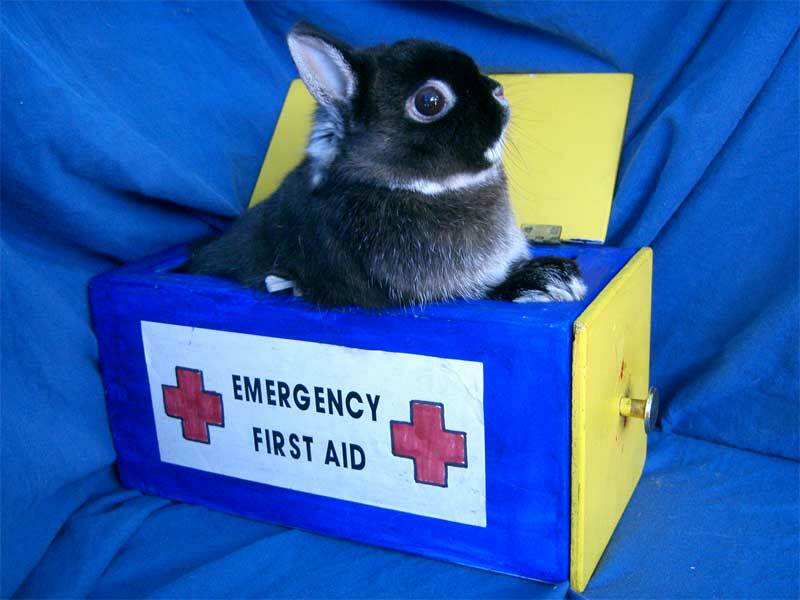 Winchester is a small, show quality Netherland Dwarf rabbit and, like all our boy bunnies, a neutered male. He’s Magic Innovations’ only “bachelor” bunny, and he’s looking for a spayed bunny friend! CADBURY (on the left) is a pet quality Netherland Dwarf Rabbit. 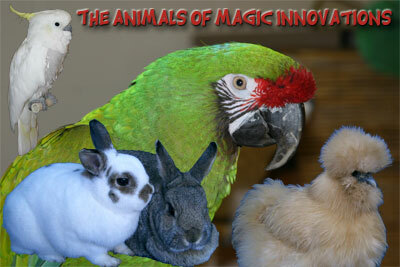 He came to Magic Innovations because his former owners believed a silly “old wives tale” about rabbit urine causing cancer in pregnant women! 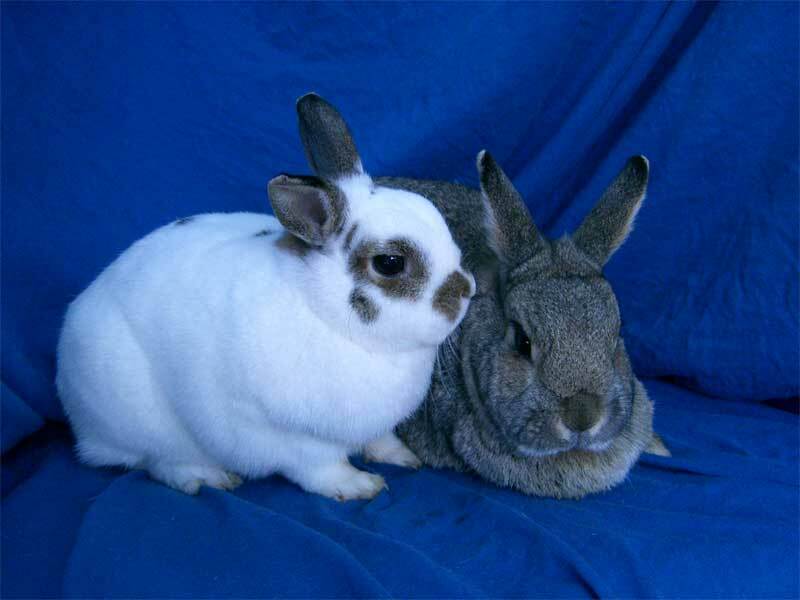 Like many young bunnies, Cadbury was a “wild and crazy guy” until he was neutered and paired up with his honey-bunny, Hazel. Cadbury acts as a stand-in magic bunny when Winchester has a bad “hare” day. Terry Runyon has been providing magical entertainment for private and public events all over San Diego County, Riverside County, and Orange County since 1984. Located in North San Diego County, he gives special consideration to events in San Marcos, Escondido, Vista, Rancho Bernardo, Poway, Oceanside, Carlsbad, Rancho Santa Fe, and Encinitas California. to ensure that you get the day and time of your choice! This page designed and maintained by DIVERSIFY! ©2008-2017. All rights reserved. Last updated 07/2017. The contents of this page may not be reproduced in any form without express written permission from Magic Innovations.